Many people view cucumbers as just a part of a boring diet. True, cucumbers are low in calories and are fat-, sodium-, and cholesterol-free (of course, they are—they are 96% water by weight! ), but they offer a little more than that. For one thing, cucumbers contain phytochemicals, such as phytosterols and terpenes, which fight against cancer. Cucumbers contain a good amount of vitamin C. One medium cuke contains about 27% of the U.S. RDA of vitamin C. Vitamin C is important to the body to maintain a healthy immune system, help regulate cholesterol levels, encourage iron absorption, manufacture collagen, and help fight cancer (as an antioxidant). Cucumbers also contain a mineral called silica, which is vital for building the connective tissue that hold together bones, muscles, ligaments, and tendons and for bone formation. 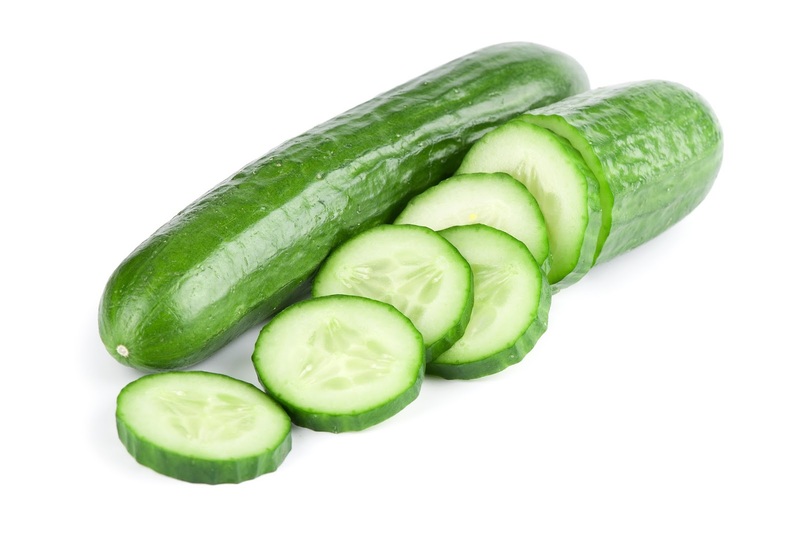 Plus, that same medium cucumber I mentioned contains 13% of the U.S. RDA of vitamin A.
Cucumbers have long been known to help improve skin conditions, as can be seen from all those health and beauty products containing the vegetable (actually, it is a fruit). They help relieve skin rashes, sunburn, and swollen eyes (can't you just see in your head all those beauty articles with pictures of women blinded by cucumber slices?). According to Herbs of the Bible by James A. Duke, cucumbers have been used throughout time all over the world to treat such ailments as colds and cold sores, dysentery, gallstones, and typhoid. In Ayurvedic medicine, they are believed to be a good diuretic because of their "cooling" properties. And cucumber juice supposedly kills cockroaches. When choosing cukes, pick those that are firm, without moldy or soft spots. The skin should be firm, not wrinkled. The color should be a vibrant green. Store them in the refrigerator for about one week. Do not keep them in a plastic bag, which will retain moisture and cause mold. Sliced in a green salad is not the only way to eat cucumbers. Below are a few great recipes. They can all be found on B's Cucumber Pages. Their original sources are noted. Put cucumber slices into a large, non-metal bowl. Toss with salt. Sprinkle with vinegar. Toss to mix well. Let stand 1 hour. Drain well in colander. Blend butter, tarragon and chervil. To assemble, spread butter over 1 side of each bread slice. 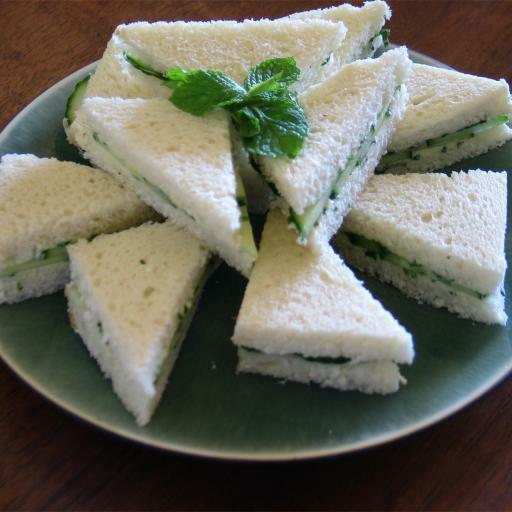 Cover 15 slices with cucumbers, dividing evenly. Close sandwiches. Trim crusts. Cut into 36 rectangles. Arrange on platter, garnished with watercress leaves. Optional: For looks, dip one end of a sandwich into mayonnaise, then into minced fresh parsley. Bring about 1/4 cup sake to a boil, immediately remove from heat, and cool. Reserve 2 tablespoons of boiled sake. Cook the bean threads according to package directions (usually, boil for 3 minutes). Drain and place the noodles in a bowl of cold water. Run more cold water over the noodles until they are completely cool. Combine 2 tablespoons of the sake with the vinegar, soy sauce, and mirin. Cool. Peel the cucumbers, cut in half lengthwise, remove the seeds, and slice as thinly as possible. Place in a bowl, sprinkle with salt, and allow to sit for a few minutes. Squeeze the salted cucumber slices. Rinse well, squeezing out all of the excess water after rinsing. In a (beautiful) bowl, place the noodles and then the cucumbers. Sprinkle on the crabmeat or bell pepper. Pour the marinade over all and serve. 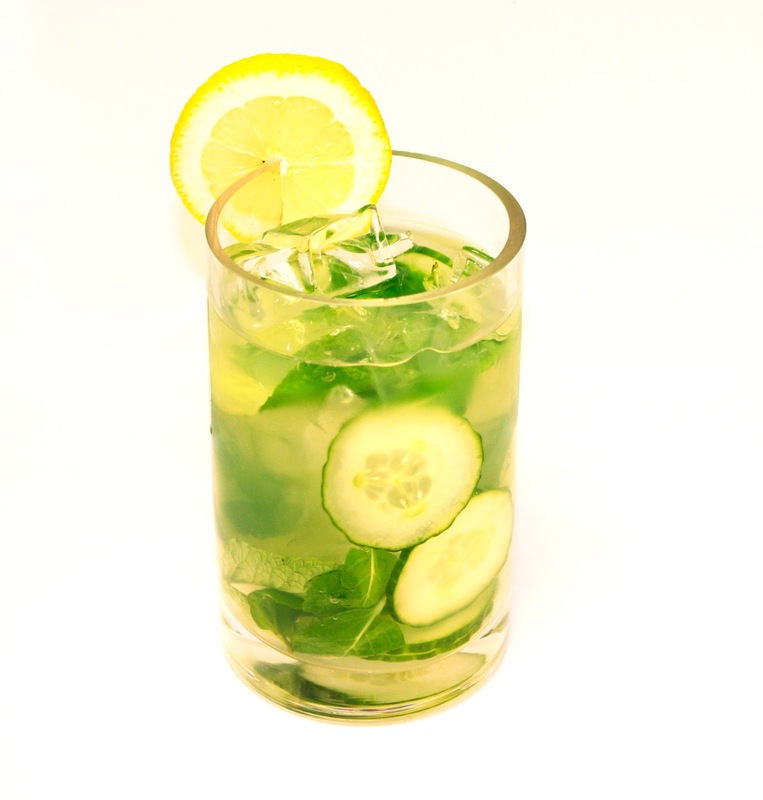 Add cucumber and water to a blender and puree. Strain. Add juice of lemon and sugar to taste. Serve over ice.